During their recent trip to India, Indiana University Master of Science in Information Systems students from the Kelley School of Business learned from information technology leaders while in the world’s No. 1 sourcing destination for IT services. The two groups of graduate students collaborated on ways to enhance the partnership between their two higher education institutions and leverage the space at the IU India Gateway office. The office is one of five in IU’s Global Gateway Network that connect the university’s faculty, students, staff, and alumni with resources to further their academic and professional interests around the globe. “For me it was just really cool to have an opportunity to interact with these students who are just as interested in our experiences in the U.S.,” said Jacob Bailey, one of the Kelley students who made the trip. 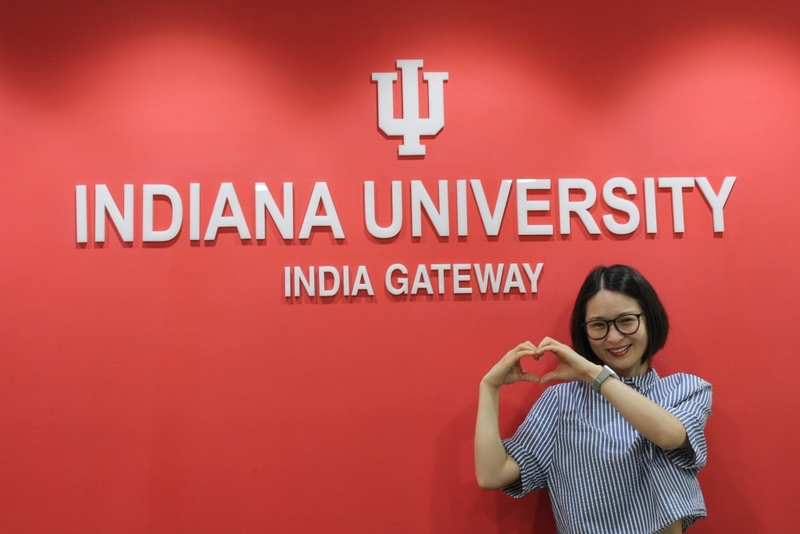 “I feel like we opened up a portal to take a look at what their college is like,” said Bingbing Zhao, another Kelley student, who said she’s kept in touch with the broad network of future colleagues she met in India. Bipin Prabhakar, clinical professor and chair of the Information Systems Graduate Program in the Kelley School who took the students on the trip, said the IU India Gateway has the potential to increase IU students’ engagement with Indian students, corporations, and education programs—an important tool in today’s increasingly globalized business marketplace. The interactions the students had with the local professionals, educators, and students left a deep impression and led them to consider how the gateway office could open up additional opportunities for IU students overseas. Kelley student Yongky Kristando said he could see advantages for future IU students who might visit the gateway in India, which represents a welcoming and reassuring presence in New Delhi to IU staff, faculty, alumni, and others. “The office becomes like a bridge to communicate two ways and gives students who visit over there a brief overview of their culture and uniqueness,” he said.